The LSM S BE from Future Automation is suitabe for screen sizes from 26" up to 65" with a maximum weight hold of 50kg. The TV lift system is extremely verstaile and will not only raise or lower a flat screen TV but also provides an impressive 180 degree swivel action. This incredible feature allows the TV to be rotated when in the raised position, this means the screen can be viewed from the front and back. 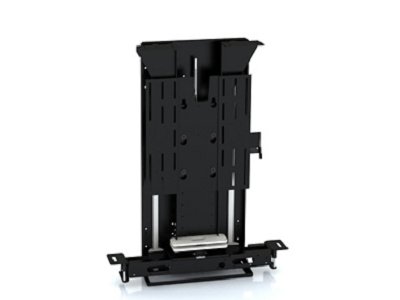 The LSM-S-BE Lift mechanism provides the perfect solution for when a compact swivelling TV lift is required, ideal for end of bed TV cabinets as the screen can be rotated to be viewed from other areas of the bedroom. This lift also has the ability to accommodate a screen enclosure so the all of the leads and connection on the back of the TV can be hidden, ideal for when the back of the TV can be seen. also requires a screen enclosure to hide the connections at the rear of the TV. the LSM S BE also allows the cabinet maker to include a matching screen surround into their furniture design. The lift mechanism comes complete with external control box an IR remote control making it fully intergratable with most brands of home automation control systems. Also available is a RF remote option which will allow the lift to operate by remote out of the line of sight, a handy addition if the unit is not being configured to an existing control system. There are five standard heights to choose from, below are the details of the maximum cabinet height along with maximum screen height. Screen sizes 26" to 65"
Hi, Can this lift lift and turn 45 degrees then stop? Maybe by cutting the power with a relay or setting?